10 –11 October 2012 – The African Centre for the Study and Research on Terrorism (ACSRT) convened a summative workshop on Evaluation Missions to East Africa, from 10 to 11 October 2012, at the AU Headquarters, Addis Ababa, Ethiopia. Participants to the meeting included representatives of the four evaluated East African member states, namely Burundi, Djibouti, The Sudan and Uganda. The European Union Commission as well as the Committee of Intelligence and Security Services of Africa (CISSA) were also represented. The two day-meeting was dedicated to sharing, amongst the participants, the findings and conclusions of the evaluation missions to East Africa and agreeing on the priority areas to be focused on. Member states that have not yet established an Finance Intelligence Unit (FIU) should take the required steps to establish one , without further delay . Member States are urged to integrate the criminalization of the payment of ransom to terrorist groups in their national legislations as stipulated by the decision of the Assembly / AU/DEC.256 (XIII), adopted in Sirte in July 2009. The need for countries to view counterterrorism Focal Points as established structures and not as individuals. The need to strengthen their capacity to effectively deliver their mandates. Provide for the creation, under a unified command, a law enforcement mechanism, in the form of National and Regional Fusion Centers, to prevent and combat terrorism and transnational organized crime, including the creation, at national and regional levels of a system of databases on crime. The need to encourage scholars and theologians to lead the intellectual debate and dialogue with a view to addressing the factors that influence radicalization and extremism. Training of Self-Defense trainers, training against maritime terrorism training in VIPs protection, training in offensive and defensive driving and advanced snipers training. Participants reaffirmed that counterterrorism measures must fully comply with international human rights law, refugee law as well as criminal and humanitarian laws. 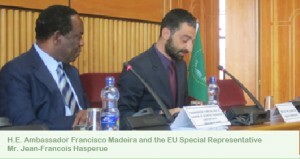 Furthermore, Member States should also comply with the resolutions adopted by the UN General Assembly (including the Strategy), the Algiers Convention on Prevention and Combating of Terrorism (1999), the African Charter of Human and People’s Rights and their counterterrorism mechanisms must be consistent with the importance that the AU attaches to the rule of law and human rights. Finally, The participants commended the work conducted by the ACSRT assessment team and expressed their wish for these evaluation missions to be conducted on a continued and frequent basis.